Today I am spending some time working on my presentation for the annual A Step Up Assistant Coaching Symposium. I have been honored to be a part of Felicia Hall Allen's vision to grow our game through educating our assistant coaches. Each year Felicia and her husband Johnny, dedicate themselves to putting on a special event and this year is not different. It's interesting to note that these presenters are now head coaches. 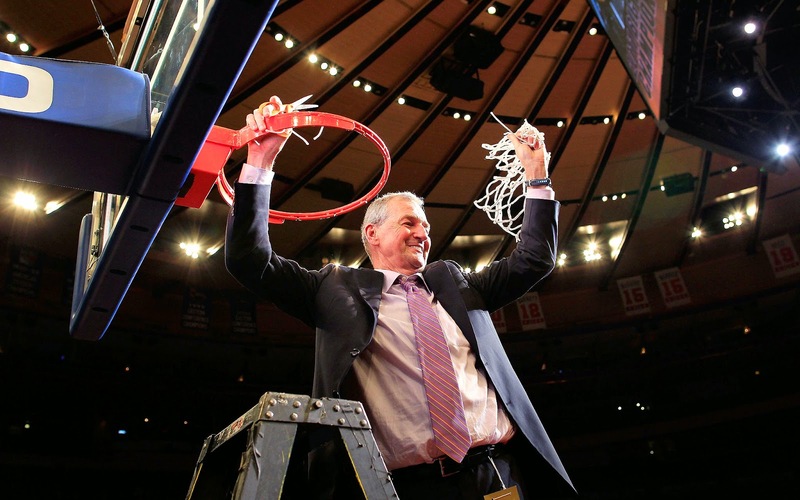 Mike Rhodes, now the head coach at Rice, gave us a look inside the "VCU Havoc Press Defense." 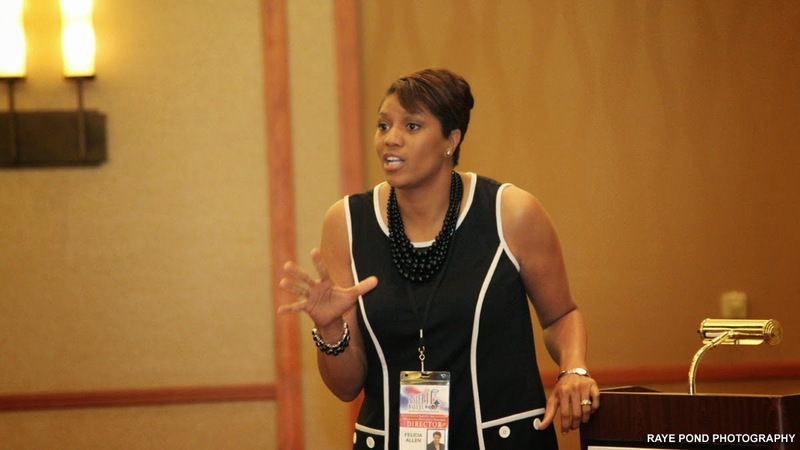 Joni Crenshaw, now the head coach at Georgia, spoke about "Presenting Yourself and Thinking Like a Head Coach." Karen Ashton, now the head coach at Texas, shared thoughts about "Positioning Yourself as a Valuable Part of the Program." A study published recently in the journal Education + Training found that there is an important line to draw between parental involvement and over-parenting. “While parental involvement might be the extra boost that students need to build their own confidence and abilities, over-parenting appears to do the converse in creating a sense that one cannot accomplish things socially or in general on one’s own,” wrote the authors, two professors from California State University Fresno. The authors of “Helicopter parents: An Examination of the Correlates of Over-parenting of College Students,” Jill C. Bradley-Geist and Julie B. Olson-Buchanan, go on to detail how over-parenting can actually ruin a child’s abilities to deal with the workplace. The study showed that those college students with “helicopter parents” had a hard time believing in their own ability to accomplish goals. They were more dependent on others, had poor coping strategies and didn’t have soft skills, like responsibility and conscientiousness throughout college, the authors found. You can read the entire article in its entirety here. 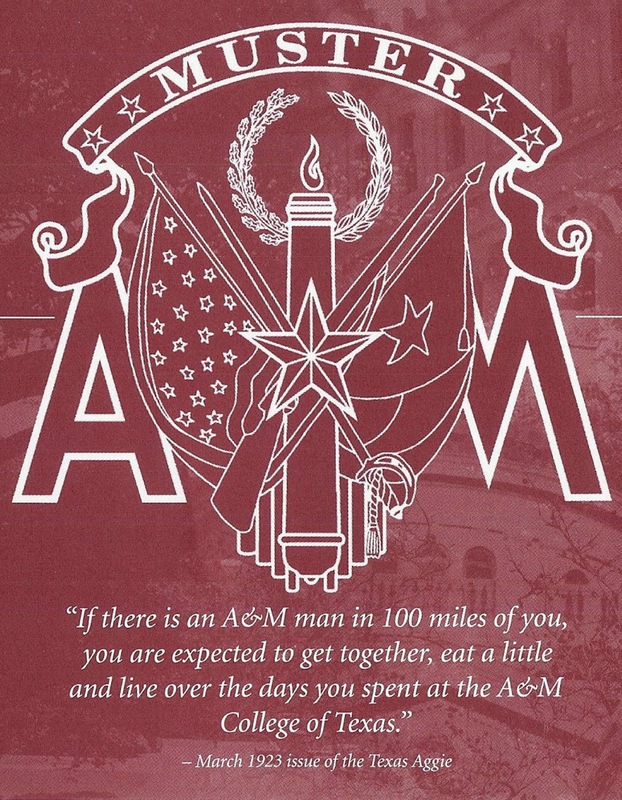 SOFTLY CALL THE MUSTER, LET COMRADE ANSWER "HERE"
First let me thank Jim Sterling and the Liberty County A&M Club for affording me the incredible honor of speaking at this year’s Muster. Please know that I appreciate the magnitude of speaking before you today. I am heading into my 4th year at Texas A&M and I have never felt more like an Aggie than I do today. What an amazing thing to know that you are a part of something special — and that you will be a part of it forever. As a women’s basketball coach, my job is not so much to win championships as it is to “build champions.” Building Champions is what Texas A&M is all about and I’m speaking beyond the athletic arena. It is the “Building Champions” mantra that separates the Aggies from all others. The most important word in building successful athletic teams is “culture.” You don’t want to have a great team — you want to have a great program. You want to build something that will sustain both success and failure. We constantly talk to them about their legacy. Legacy and culture go hand in hand. Legacy is about what you are leaving behind to those who follow you. Legacy is what makes Texas A&M an amazing institution. "There's a Spirit can ne'er be told..." And it really true. People constantly ask me what makes being an Aggie so special and I tell them it is so difficult to truly explain unless you are one. By the same token, as someone who has worked at four other universities, I truly hope you know how different, how unique Texas A&M is. Sometimes, being someplace for an entire lifetime can lead to a blurred vision as to its greatness. 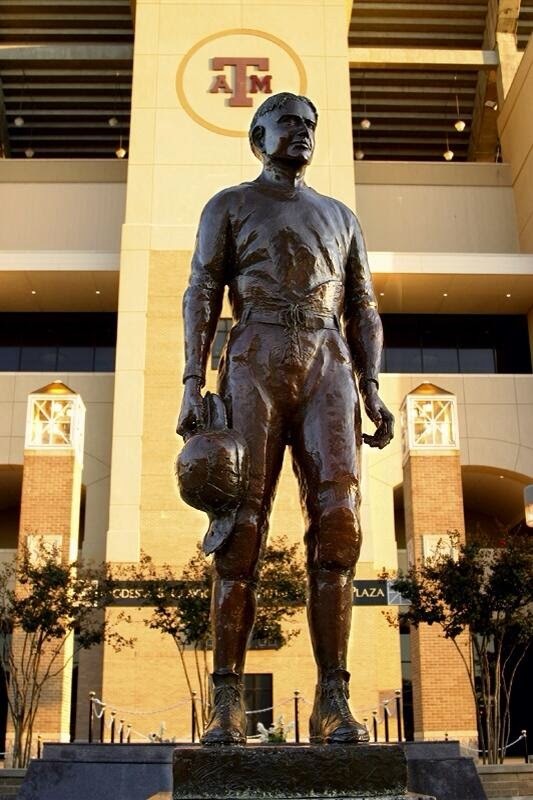 Texas A&M has the greatest of traditions because they honor all that is important in being an Aggie and what should be important as a human being that walks on the face of the earth. The start of an outstanding program is recruiting...targeting the best players...get them on campus and then indoctrinating them with The Aggie Way...and for Aggie students, Fish Camp, serves the same purpose...think about it? 1,100 counselors willingly give up time and effort in order to welcome Texas A&M’s freshman to teach them greatest and most important traditions: Our Freshmen Class. No school goes to the extent to do this. 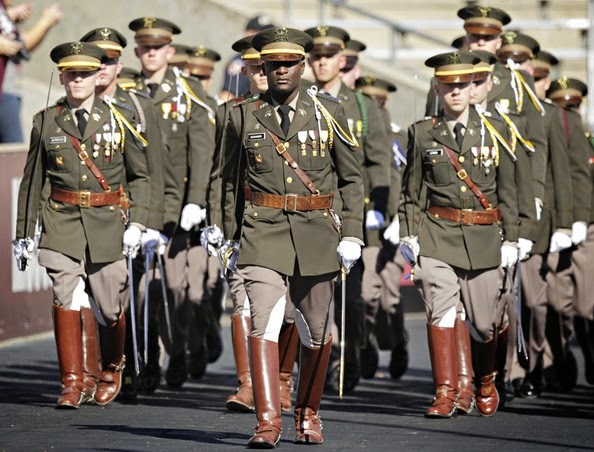 The Corp of Cadets — The men and women of the Corps form the largest uniformed body of students outside the service academies. A time-honor group that has indeed changed the course of history. As someone who has a father that served in the Army along with two grandfathers in World War II, one, a Marine that was wounded at Pearl Harbor and another in the Navy who served in the South Pacific, I have an appreciation for the ultimate sacrifice made for our Nation. It is that type of courage and sacrifice that we want to instill in our teams. Please don’t misunderstand me — we aren’t asking them to “hold Corregidor” — be we are asking them to understand those qualities displayed in the Corps. Understanding your role is one thing, owning it is another. Is there a greater role than the 12th Man. We want the young ladies that sit out bench awaiting an opportunity to help their team to do so in the same spirit that Earl King Gill did in 1922. We want our players to understand the value of selfless service...there is no better example than TheBig Event — the largest student-run service project in the nation. Over 20,000 students giving up a day to and volunteering to do 2,500 jobs in the Bryan/College Station community. No successful organization, team or society can survive that does not take the opportunity to remember it’s fallen...Silver Taps is another tradition at Texas A&M like no other...it speaks to another quality of excellent teams — loyalty. Muster — It is more than a ceremony; it is a responsibility that is handed down from one generation to the next. What an amazing day to marry the past with the present. A chance to honor those who have made Texas A&M. “The Roll Call for the Absent” not only allows us to pay homage to those we’ve lost but also to send a powerful message to those who will lead us into the future. Our team in many ways plays at a high level because of how they view the alumni that have worn the uniform down through the years. We just celebrated our 40th anniversary of women’s basketball at Texas A&M with a year-long celebration of our past. It included alums constantly stopping by and speaking to our team and sharing their own stories. But every day are walls are plastered with photos and memorabilia of past teams, players and moments. One of the things that I think is essential to an off-season is taking a detailed look back. And part of that look is studying your mistakes and your failures. By the way, this is the same approach I take after a Final Four season or a Conference Championship campaign when it might be human nature to sit back, rest and past yourself on the back. The reminder is always good is the enemy of great. The primary way to grow is by studying failure. Bob Knight has said "To win a game, you must first understand what goes into losing." Mistakes and failures are some of our greatest teachers if we indeed take the time to learn from them. Elbert Hubbard said, "A failure is a man who blundered, but is not able to cash in on the experience." The players and coaches who lose out are the ones who don't examine their shortcomings or utilize excuses as the reason for their setbacks. 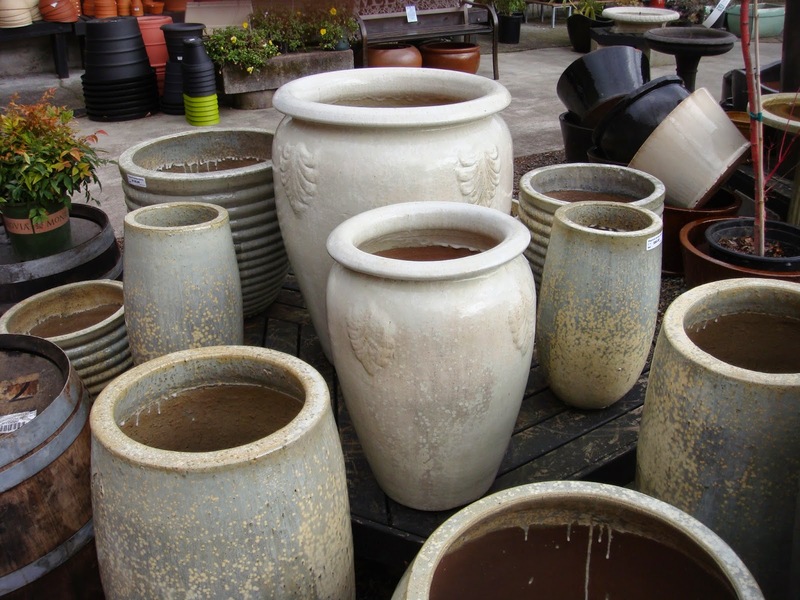 The ceramics teacher announced on opening day that he was dividing the class into two groups. All those on the left side of the studio, he said, would be graded solely on the quantity of work they produced, all those on the right solely on its quality. His procedure was simple: on the final day of class he would bring in his bathroom scales and weigh the work of the "quantity" group: fifty pounds of pots rated an "A," forty pounds a "B," and so on. Those being graded on "quality," however, needed to produce only one pot -- albeit a perfect one -- to get an "A." Well, come grading time and a curious fact emerged: the works of the highest quality were all produced by the group being graded for quantity. It seems that while the "quantity" group was busily churning out piles or work -- and learning from their mistakes -- the "quality" group had sat theorizing about perfection, and in the end had little more to show for their efforts than grandiose theories and a pile of dead clay." A great story from Maxwell's book. To get...to gain...one must do. It is in the action, the process, that we move closer towards our ideal. The following is an excerpt on James Hardin on the art of getting to the free throw line. It was written by Andrew Keh of the New York Times and you can read it in it's entirety here. I have long been a big believer in the importance of getting the charity stripe on offense and equally firm in the need to keep your opponents from getting there. At a very young age I can remember Bob Knight at his Coaching Academy talk about the Hoosier's goal of making more free throws than their opponents attempt -- which speaks to both offensive and defensive play. What I found interesting in regard to Hardin was that he doesn't drive to be fouled but works to get the ball to the rim when possible and this creates a foul. Far too many players are thinking primarily of getting fouled as opposed to making the field goal. This leads to a lower percentage being made regardless of whether they or fouled or not or if the foul is called. 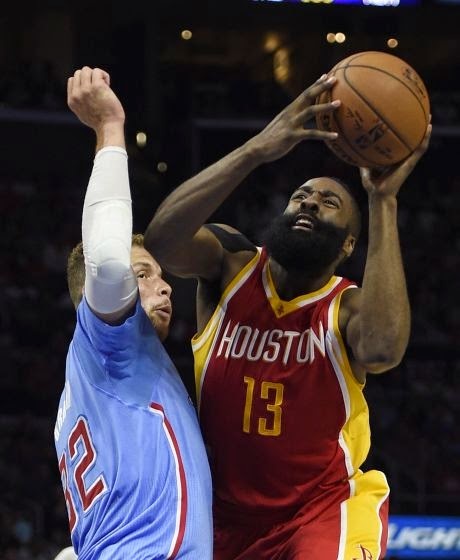 His only aim is to score the basket, Harden said, and if any defenders want to swipe at the ball to stop him, they can. But, he added, when he makes a move to the basket, he drives hard, and fouls are sometimes a byproduct. Still, he was asked, what about the way he flattens out his arms to make them susceptible to being smacked, or how he changes pace on his dribble at counterintuitive times to create collisions, or his tendency to cling to defenders’ bodies even when freer paths to the rim seem to exist? Harden smiled. “That’s just being crafty,” he said. A crucial factor in Harden’s remarkable season has been his production at the free-throw line, where his shooting percentage is .866. Through Monday — when Houston beat Charlotte, 100-90, and Harden scored 29 points while making 14 of 16 foul shots — Harden has registered a league-high 816 free throws and has made 707. Second, far behind, was Westbrook, who had taken 629 through Sunday and made 525. Through 81 games — only one of which he had missed — Harden was averaging 10.2 free-throw attempts, with 8.8 of them successful. Both figures were also league highs. He is just the 11th player in N.B.A. history to sink more than 700 free throws in a season. “Getting fouled is definitely an art, and he’s very good at it,” Rockets Coach Kevin McHale said, adding that Harden’s body awareness allowed him to initiate contact that works in his favor. Steve Javie, a former N.B.A. referee who analyzes officiating for ESPN, explained that Harden had an uncanny knack for sensing when a defender had entered into an illegal guarding position and initiating contact at that very moment, creating a defensive foul that might not have materialized otherwise. How does he do it, then? To start, Harden’s tactics would not work if he did not already possess a devastatingly varied offensive skill set. For casual viewers, he may not inspire the same delight as Curry, who fires shots from absurd ranges and swaggers back down the court before they land, like an action-movie star strolling away from an explosion. But Harden’s intelligence and technical sophistication have won him widespread admiration. “It’s difficult to ever figure out what he’s going to do because he scores in such a variety of ways,” said Terry Stotts, the coach of the Portland Trail Blazers, who knocked the Rockets out of the playoffs last season. 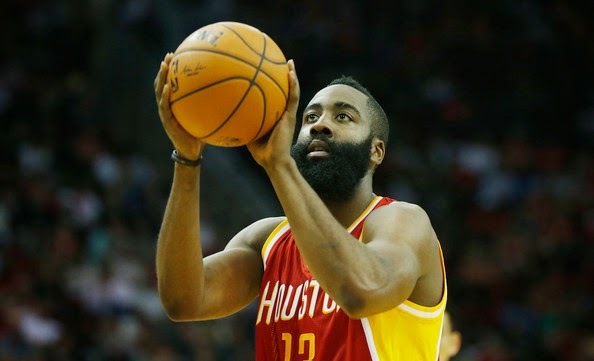 Harden’s array of weapons instills in defenders high levels of respect, fear and uncertainty and a basic desire to stop whatever Harden might be doing at a given moment. In turn, he plays off these impulses. It helps that he has strong hands and an equally strong grasp of league rules. Such a loss of self-determination is common among those who guard Harden. He isolates defenders, stares them down, flinches, twitches, and moves his eyeballs. If the opponent loses his equilibrium, Harden accelerates, clipping a piece of hip or shoulder or leg on the way. I've heard it said/tweeted recently and I always cringe when I do, "College is the best four years of your life." If college is the best four years of a student-athlete's life then we haven't did the job we are suppose to in preparing them for greater things in life. Don't get me wrong, we always want their college experience to be memorable and special -- but it should always be a stepping stone to even greater things. I mean are we actually telling our student-athletes that college will be the best four years and that everything else will be less -- that it's all downhill from here. On the night of January 4th, 2006, I watched the most incredible athletic performance I’ve ever seen with my own eyes. I was a redshirted scout-team offensive lineman for the #2 team in the country. I had done all I could to prepare our first-team defense for what many considered to be the best college football team to ever play, the 2005 USC Trojans. You would have thought we were a 6-6 team they way ESPN talked about our matchup… Of all the talking heads I only know of 1 person that actually picked us to win the game, Lee Corso. That night I watched our team play their hearts out. Never give up. And fight like they had a slugger’s chance the whole 60 minutes. Vince Young played the best game of football I’ve ever witnessed. Seriously. 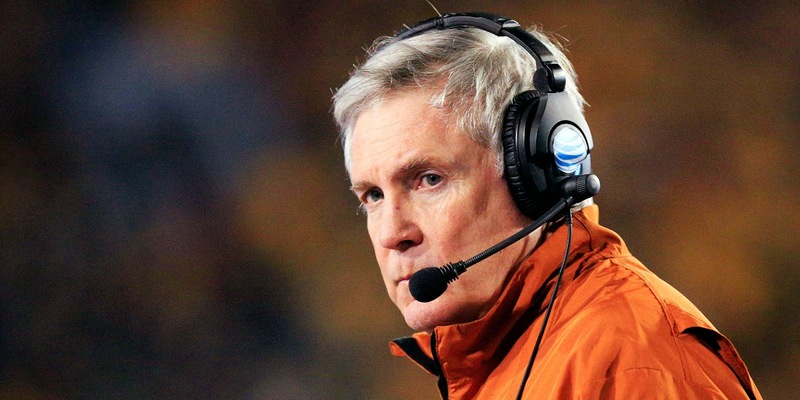 That game is what every Texas fan remembers… Who could forget such an extraordinary sight?!? If those same story lines were played out in a movie, no one would believe it could happen in real life. Coach Brown could have told us many things… Of course he congratulated us. Of course he was proud of us. He told us we were champions and that nobody could ever take that away from us. All those things were true. But he emphasized what was important. He knew the men in that locker room wouldn’t always be football players. So he told us to not let this be the best thing that ever happened to us. But to go on to be great fathers, great husbands, and great citizens. Coaching football, in real sense, is not about winning games. It’s about investing into and shaping the character of young men. 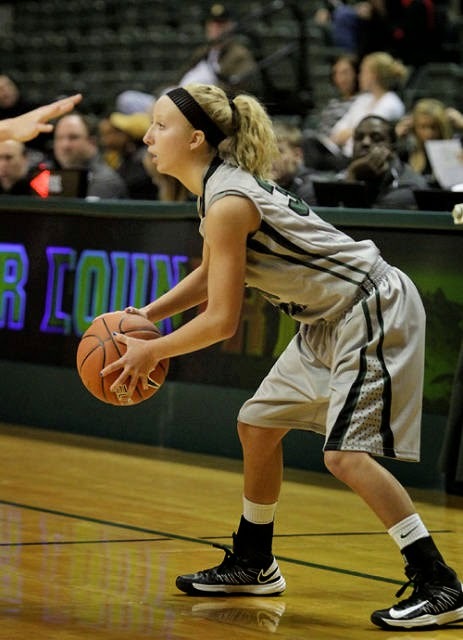 I have never had the opportunity to meet Abby Jump, a three-point shooting guard that plays for Wright State. But she has a big fan in me. Abby has spent the last seven months rehabbing an injury...being away from basketball as she has known it for the better part of her life. But instead of wallowing in self-pity she has utilized the time to look at herself and the game through a different set of lenses. One of my friends made through our relationship with Coach Don Meyer is Keith Freeman who is an assistant coach at Wright State. This past weekend at the PGC/Glazier Coaching Clinic we were talking about Coach Meyer, basketball and student-athletes that had great attitudes and worked hard. This morning, he shared with me a paper written by Amy in which she speaks to the process she's gone through and how she has grown from it. Our team at Texas A&M currently has three players rehabbing from injuries and I will share this with them as well. As a basketball player you prepare yourself everyday. Offseason, regular season, and post season, you are always preparing. Preparing for practices, games, individual workouts, lifting, and if you want to get more specific, studying your plays and opponents. However, the last thing you prepare for is an injury, especially a long-term injury. We can handle full court presses thrown at us and 1-3-1 traps but as soon as an injury happens, it is natural to immediately hit the fetal position. The way I see it, when an injury occurs you can still look at it as if it is a full court press. How you handle and overcome an injury can either be a quick turnover or a hard- earned layup at the other end. For seven months I wondered everyday if I would play basketball again. Some of those days I wondered if I would ever walk, sit, or stand without pain again. Back injuries can be severe and scary. For those seven months I was not only thinking of basketball, I was envisioning my life outside of it. My injury taught me about myself and about others. It opened my eyes to things I have been blind to everyday. It showed me the hard knocks of life and how to see the light at the end of the tunnel. It showed me the game stripped down from the sidelines everyday. I could never deny that I was angry, scared, and frustrated everyday. But I also was thankful that God entrusted me enough to throw something of this caliber on my shoulders and know I would make it through. Because I know I would never be given something I could not handle. Although some days seemed the complete opposite. Like I said, you are always preparing in basketball. What I did not realize was my injury was preparing me for life, whether I liked it or not. For seven months sidelined I wrote down notes of what I realized and learned about life and basketball from my coaches and teammates. Although no two injuries are the exact same and everyone handles them differently, my hope is, these notes may help some basketball player trying to break a full court press of their own. There is enormous value in being a good friend and teammate. You never accomplish all that you accomplish alone. The most important stat for players to pay attention to: Leading your team in effort. ◄Rarely turns the ball over. Be grateful for every ounce of talent and opportunity God has given you. He chose you to give them to. Be thankful. Opportunities are not seen with your eyes. They are seen with you mind. If you only look at what you don’t have and what isn’t there, you will never enjoy what is there and what you do have. You may have succeeded in high school off of raw talent, but you will never succeed in college without a tremendous work ethic and tremendous attitude. Sometimes the biggest obstacle in life is getting over yourself. BE HUMBLE. Enjoy all there is to enjoy about basketball because one day, no matter who you are or how great of a player you are, one day that ball will stop bouncing. Your coaches and teammates learn a lot about you from the way you handle things being thrown at you. Not just what you do with a ball in your hands. A choice to have a great attitude is something that nobody or no circumstance can take from you. A rising tide will raise all boats. Make the people you are surrounded by better! How great of a teammate and a leader you are isn’t determined by how much power you have. It’s determined by how much you serve and sacrifice for the people around you. Be a servant leader, you’ll never regret it. You can only hold your teammates accountable if you can be honest with yourself and accept your role. You have to recommit yourself everyday to the cause. Some days you won’t feel well or don’t want to be there, but that’s never an excuse. Be committed. Great teammates want to see the guy next to them succeed just as bad as they want to succeed themselves. Be selfless. When you wake up in the morning, one positive thought in the morning can set the course for the entire day. Find a way to win the day. It’s all about the process. Putting people together that believe in each other, play hard for each other, are accountable for each other, and are selfless. If a team can buy into that then they can be successful. Too many people forget that happiness doesn’t come from getting what we don’t have. It’s about recognizing and appreciating what we do have. When you have something taken from you. Whether it’s a short or long amount of time, it’s humbling. You become even more grateful for having the opportunity to do something you love. Life is too short to be bitter. Bitterness never takes away from the pain, it adds to it. When you have a 4 low baseline out of bounds offensive play, make sure your pass will be caught. If not, no one will be back for transition defense. Even experiences we think are awful can carry the seeds of a great blessing. Less is more. Don’t try to be a player you aren’t. It’s important as a guard to have a go to move and a counter move in transition. When you have the right culture it will attract high-level players. Players think little about body language! Be aware that your body language to your teammates and coaches doesn’t whisper, it screams! One of the main things I learned about leadership: People always say leadership is not about you. I disagree. I think is about the example YOU set and example YOU live for OTHERS. Be conscious of your actions and your decisions. There’s a huge difference between interest and commitment. When you are interested in something, you do it only when you feel like it. When you are committed to something, you do it ALL the time. The problem with players today is, they are only committed when they are conditionally bought in. Meaning, when things are going well for them, then they are committed to the cause. If things are going well, then they have a good attitude and they are coachable, they listen. But if it’s not, they are the complete opposite. They think it’s ok to not be coachable, to have a bad attitude, and to be a bad teammate. Don’t fear making mistakes! That is the greatest mistake you can make in life is to not take enough risks. That is how you grow! Not by doing everything perfect. You become your habits in pressure situations. Make the right decision. Never make the easy decision because more than likely it isn’t the right one. Peer govern your teammates if you are a leader. Don’t just worry about yourself and making sure you do right, make sure your teammates do right also. TIM CORBIN: "VIDEO IS A COACH IN ITSELF"
SABAN ON "THE ILLUSION OF CHOICE"